This ‘dolphin drive’ season, more than 150 bottlenose dolphins have been rounded up and taken from Japan’s Taiji Cove, forced into dolphin shows in captivity, and most destined to make their way into the meat trade. Some time in the ’90s, when terrestrial television ruled, I remember watching an episode of The Simpsons in which killer dolphins rise up to take over the planet. The Simpsons is smart, very smart — I’ve read an essay or two about the incredible mathematical problems and references snuck into series after series — and I think with their killer dolphin takeover, they were onto something. No, I don’t believe that dolphins are going to rise up, find a way to walk on land and wipe out the human race (though occasionally I wish they would…), but I think the interesting thing is that something as (unfortunately) flippantly dismissed as a comedic cartoon, was actually educating children that dolphins have language. And to have language — not just calls for mating and warning – one must have independent, free thought. It’s easy to relate to species that look like us. Species that have two arms, two legs, fingers and thumbs. Great apes where we can trace our common ancestry; chimps and bonobos especially, where we can recognise a language in their utterances and teach them how to use basic signing to ‘talk’ with us. 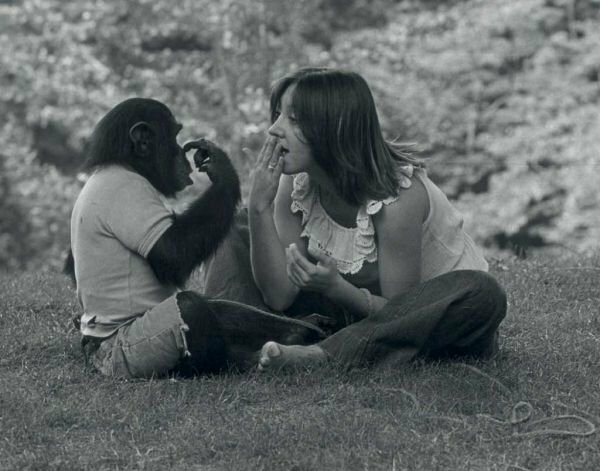 During my time as an English Language and Communications undergrad, we studied in great detail an entire module on the successes and failures of scientist teaching chimpanzees, like the well-documented Nim Chimpsky, how to communicate the human way. I can’t help but think that although this doesn’t bring a blanket safety to the species from atrocities such as poaching for the bush meat trade or to supply Chinese medicines, it does help us in western societies relate to the creatures and recognise them as sentient beings. But pound for pound, relative to body size, dolphin’s brains are larger than those of chimpanzee’s. They are, in fact, among the largest in the animal kingdom. As well as an impressive flair for problem-solving and a capacity to plan for the future, dolphin’s varied and complex language at least equals our own. They not only whistle and click, but they also emit ‘burst pulses’ to discipline their young and defend themselves against sharks. 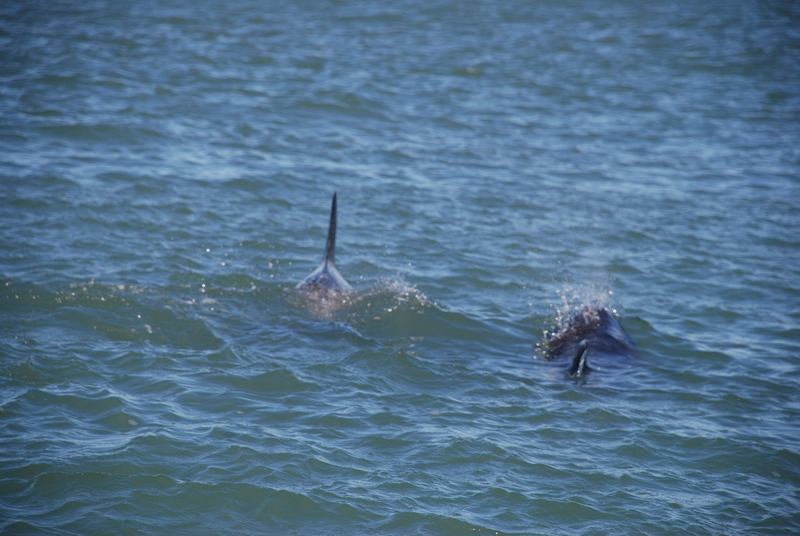 They even eavesdrop on the echo-locating clicks of other dolphin pods to figure out what they’re looking at. But without arms and hands and fingers, such highly communicative beings have only been taught to respond to human commands when they could have so valuably had their articulations studied and dissected to reveal the exact nature of their intelligence. I wonder if a different physical form and a different means of language would have saved them from the fate of hundreds of thousands that will now be facing slaughter from September 1 in a place called Taiji Cove in Japan, in the name of ‘cultural tradition’. After watching the shockingly powerful and effecting documentary The Cove (available to view here), I felt compelled to act in some way, and in January 2015, joined one of the biggest protests against the Taiji slaughter of recent years. As another killing season commences this month; as do the protests. Throughout last year, and in doubt with documentaries such as The Cove at the helm, I’ve seen the public and media interest in dolphins soar, which is wonderful for helping to understand the complex multi-layered nature of these creatures. For example, similarly to humans — as I believe anthropomorphism helps the cause of compassion towards these animals — dolphins seek the fun, playfulness and social interaction of natural highs; in their case using the secretion of pufferfish toxins to get their fix. 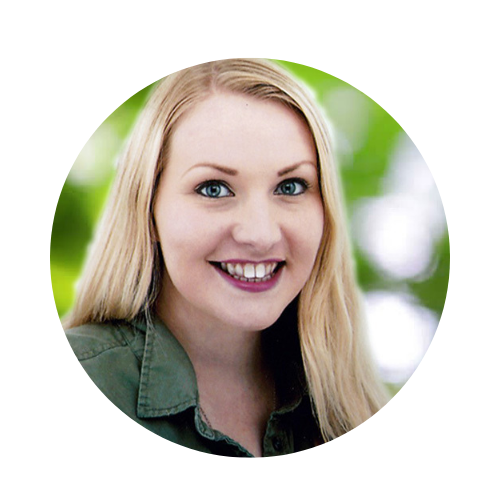 I believe that this high intelligence and ability to use tools, as well as their highly effect methods of communication, stem from their social structures, which are also integral to their well-being. Dolphins’ communities require intimate social and emotional bonds that reveal the highly developed way they process emotions. “It turns out that there is strong evidence to suggest that at least one kind of dolphin sound, studied extensively over the past decade, does function as a kind of referential symbol. Dolphins use distinct “signature whistles” to identify and call one another. Each dolphin is thought to invent a unique name for itself as a calf and keep it for life. Dolphins greet one another at sea by exchanging signature whistles and seem to remember the signature whistles of other dolphins for decades. If we cannot recognise the importance of this species and the wealth of what we can learn from them, then I can’t help but feel all those hours I spent during my degree learning about the scientific study of chimp’s engagement with language were wasted. Because science requires growth; new thinking and challenge before it can progress. And progress cannot be made, and it our knowledge not broadened, if we cannot consider an animal’s mind, brain, communication and intricate system of utterances just because they do not possess two arms and two legs. If you’re interested in learning more about the dolphin’s ability to learn, and their incredible intelligence at large, Born Free Foundation have released a book on their successful rehabilitation of Britain’s last ever dolphinarium-captive dolphins, Misha and Tom back into the wild. Find out more here. An extract of this article first appeared in Big Issue Magazine, viewable here: LIKE APES, DOLPHINS ALSO ‘TALK’ – AND NEED PROTECTION.